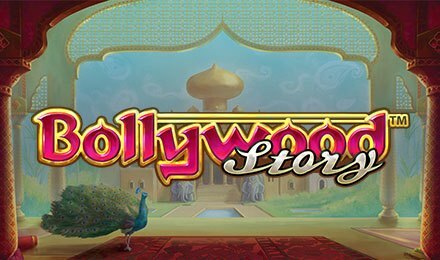 Discover Indian cinema on Bollywood Story Slot at Moon Games! This NetEnt creation comes with 5 reels and 9 paylines. It is based on a Bollywood style love story set somewhere in India. The game’s backdrop shows a lovely palace where all the action takes place. The story is about 2 lovers being separated because their parents do not approve of their relationship. The main reason is the difference between social classes, since the girl is rich and the boy poor. So, they must face all kinds of hardships before being able to reunite. The reels of Bollywood Story Slot are set within an ornate frame and consist of the following symbols Bollywood Story Logo, Bride, Groom, Father, Mother, A, K, Q, J and 10. Launch this slot on any device at Moon Games! Begin your gameplay on Bollywood Story Slot using the + and – buttons on the Coin Value and Level fields to adjust your stake. When you are ready, click on the Spin button to enjoy the game. You can trigger a win when combinations of 3 or more similar symbols are formed on the reels. Do you want to speed things up? Enjoy several rounds played in rapid succession with the Auto Play feature! Bet Levels: Select 1 to 10 bet levels on the Level field. Amount of Paylines Selection: The 9 paylines stay active during all the spins and cannot be modified. Coin Values: The available coin values are 0.01, 0.02, 0.05, 0.10, 0.20, 0.50 and 1.00. The Blue Gemstone represents the Scatter symbol that helps to activate the Free Spins Feature. The flowery Floating Wild on Bollywood Story Slot replaces all symbols, except Scatter. On every spin during the main game and free spins, it appears over regular symbols to turn them into Wilds. During the base game, 2 to 4 Floating Wilds are triggered on each spin. Three, four and five Scatters on the reels reward you 10, 20 and 30 free spins, respectively. Three to six Floating Wilds land on each spin. The free spins can also be retriggered within the feature. So, you can earn up to 60 free spins! Plus, if you land 5 Bollywood Story Logos, you can win up to 1000x your stake. Discover the wonderful and dramatic love story on Bollywood Story Slot at Moon Games. Best of luck!